PONY PEOPLE: Cross-stitching for liiife! On Anne's birthday we spent almost half of the day looking at this awesome website with a million cross-stitching packages, and at the end we both ordered one to try it out. This week they came in and they are so beautiful! The wool is really soft and thick, which makes the stitching very easy and fun to do. 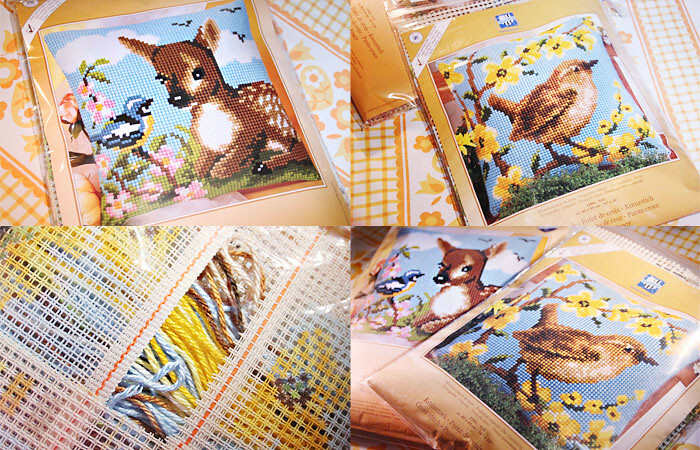 The picture is already printed on this very thick cloth and you just have to cross-stitch it on. In the end you can sew a piece of fabric to the back to make it into a pillow, and it's rather large (40 x 40 centimeters) which is very nice. I've done normal cross-stitching before (on a normal piece of cloth), but you need some very bright light to do that (and it's so dark these days!) and be really focused. This is so much easier! But most importantly, I just love those old pretty pictures, and the website that we bought them from has so many more beautiful patterns waiting for us, that you shouldn't be surprised if in two years our whole houses are covered in these pillows haha! We will of course keep you updated once they're done! ben benieuwd naar 't resultaat. Ja en het is zó leuk om te doen!! Ik ben nu al heel ver haha, kan gewoon niet stoppen! mooi! lijkt me ook wel leuk om te doen ja! @Sunaina ja heeel leuk om te doen! Maar ik heb hem nu al af haha :/ en nu wil ik een nieuwe, maar kan niet kiezen!